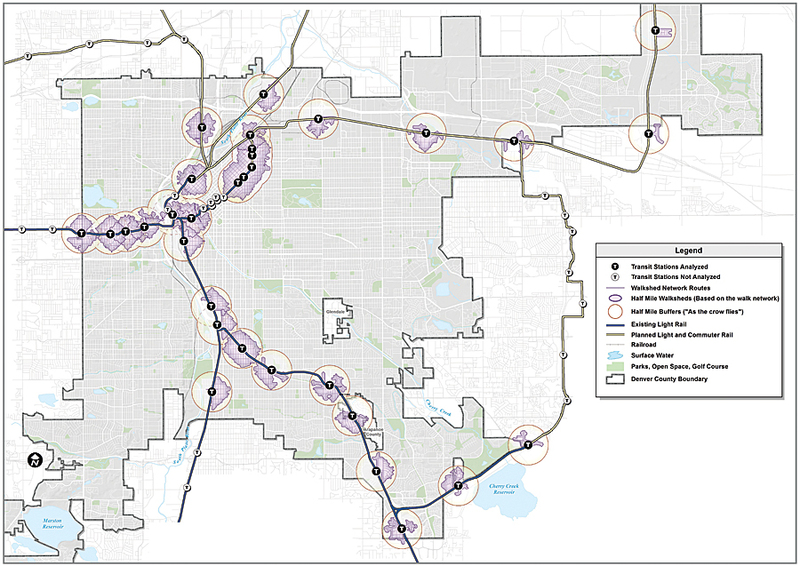 By analyzing network-data-based routes where people can actually walk, Denver's Community Planning and Development (CPD) Department GIS staff provided planners with better information to design communities that promote the use of public transportation. 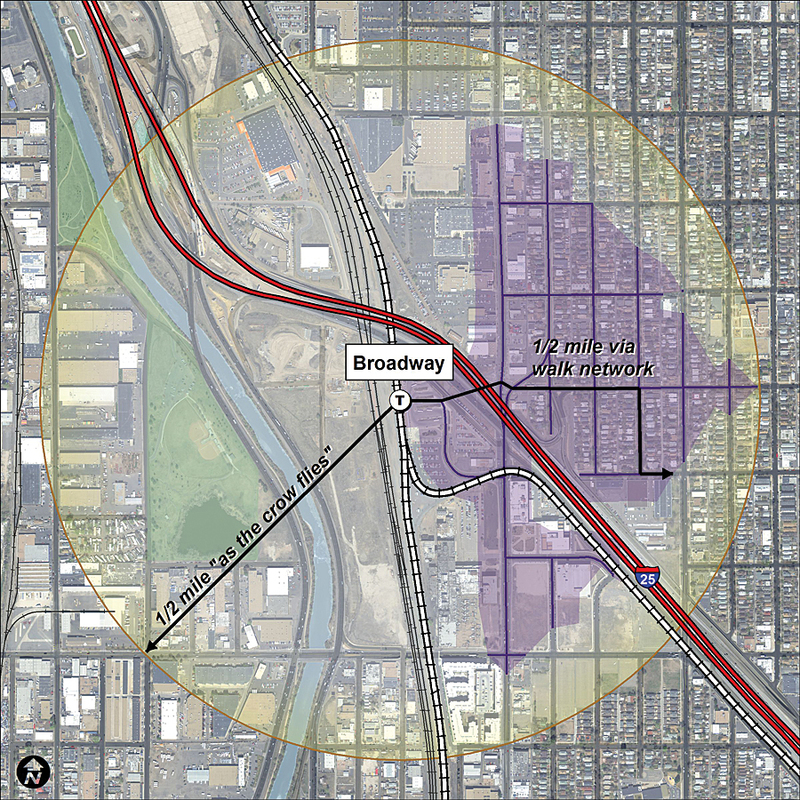 As the population of the Denver Metropolitan Area continues to grow, improving transportation infrastructure and mobility options becomes key to the region's success. Commitment to transit has been demonstrated through the Regional Transportation District's FasTracks program, which has more than a hundred miles of new commuter rail and light-rail planned, under construction, and completed. 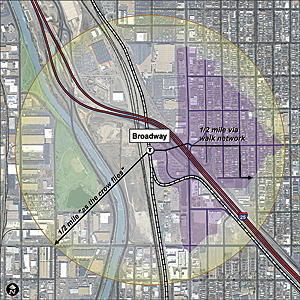 As this expanded system is being constructed and stations are established, Transit Oriented Development (TOD) has become a high priority for the City and County of Denver. 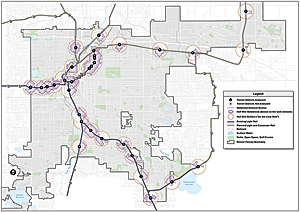 Denver's CPD has taken a lead by maintaining a TOD Strategic Plan and adopting numerous small area plans specific to individual stations. In the past, CPD has mapped TOD walksheds "as the crow flies." An area mapped using this approach may contain places that are not necessarily accessible to pedestrians. For the 2014 Strategic Plan Update, planners wanted to produce more accurate representations of the transit station area walksheds. To accomplish this, CPD GIS staff used the ArcGIS Network Analyst extension to map a half-mile distance against a walk network that incorporated off-street trails and pedestrian bridges and took into account barriers such as highways, rivers, and railroads.